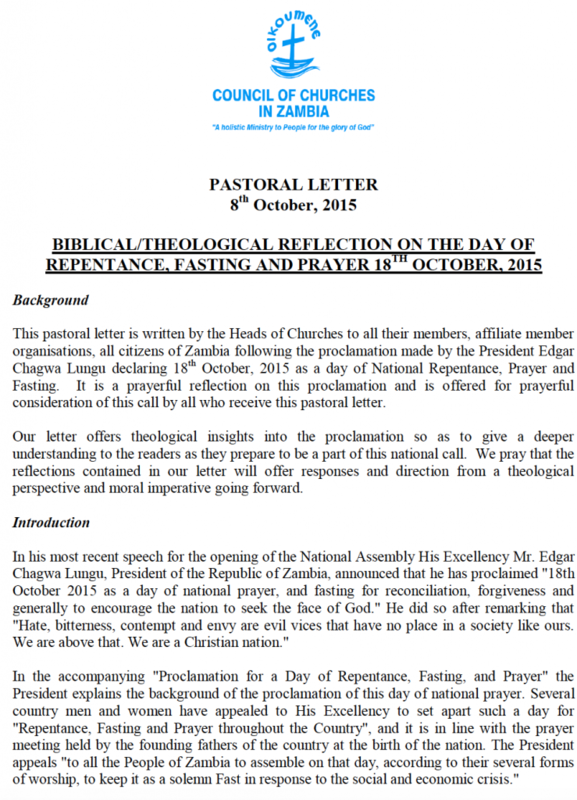 This pastoral letter is written by the Heads of Churches to all their members, affiliate member organisations, all citizens of Zambia following the proclamation made by the President Edgar Chagwa Lungu declaring 18th October, 2015 as a day of National Repentance, Prayer and Fasting. It is a prayerful reflection on this proclamation and is offered for prayerful consideration of this call by all who receive this pastoral letter. Our letter offers theological insights into the proclamation so as to give a deeper understanding to the readers as they prepare to be a part of this national call. We pray that the reflections contained in our letter will offer responses and direction from a theological perspective and moral imperative going forward. Introduction In his most recent speech for the opening of the National Assembly His Excellency Mr. Edgar Chagwa Lungu, President of the Republic of Zambia, announced that he has proclaimed “18th October 2015 as a day of national prayer, and fasting for reconciliation, forgiveness and generally to encourage the nation to seek the face of God.” He did so after remarking that “Hate, bitterness, contempt and envy are evil vices that have no place in a society like ours. He continues to describe this crisis: disrespect, poverty, a weak kwacha, load shedding and general distress. He notices that even “the wise counsel of the learned among us” is not going to solve all of this, so “as a Christian nation” we should turn to God. He recalls the promise from the book of Chronicles that if God’s people humble themselves, God will forgive their sin and heal their land. The people of Zambia are called upon to humble themselves before God, “confessing our individual and national sins, in fasting and prayer.” God is asked to remove from us “our pride of opinion,” which is connected to the “desire to be applauded by men rather than God.” God is also asked to “save us from the horrors of tribalism and disunity,” before closing the proclamation expressing the desire that God blesses “the works of our hands.” In this reflection we would like to place this day of repentance, fasting and prayer into a broader Biblical/theological context. 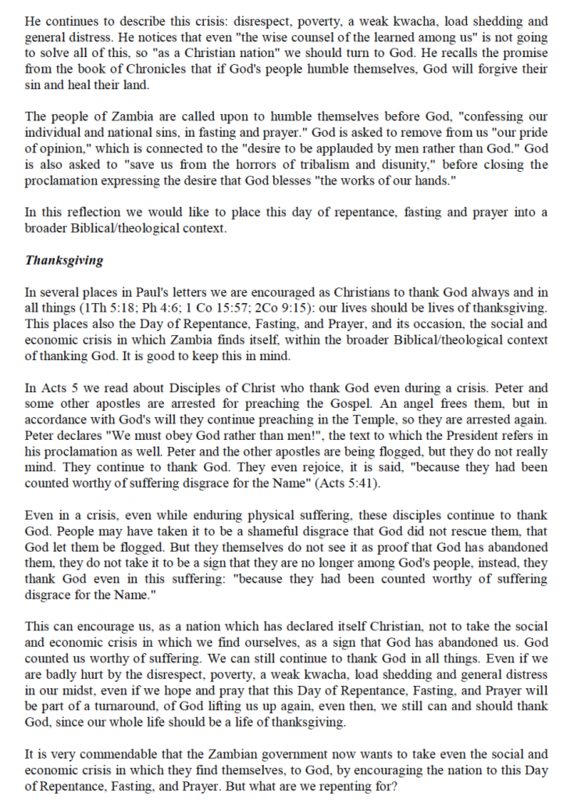 Thanksgiving In several places in Paul’s letters we are encouraged as Christians to thank God always and in all things (1Th 5:18; Ph 4:6; 1 Co 15:57; 2Co 9:15): our lives should be lives of thanksgiving. This places also the Day of Repentance, Fasting, and Prayer, and its occasion, the social and economic crisis in which Zambia finds itself, within the broader Biblical/theological context of thanking God. It is good to keep this in mind. In Acts 5 we read about Disciples of Christ who thank God even during a crisis. Peter and some other apostles are arrested for preaching the Gospel. An angel frees them, but in accordance with God’s will they continue preaching in the Temple, so they are arrested again. Peter declares “We must obey God rather than men!”, the text to which the President refers in his proclamation as well. Peter and the other apostles are being flogged, but they do not really mind. They continue to thank God. They even rejoice, it is said, “because they had been counted worthy of suffering disgrace for the Name” (Acts 5:41). Even in a crisis, even while enduring physical suffering, these disciples continue to thank God. People may have taken it to be a shameful disgrace that God did not rescue them, that God let them be flogged. But they themselves do not see it as proof that God has abandoned them, they do not take it to be a sign that they are no longer among God’s people, instead, they thank God even in this suffering: “because they had been counted worthy of suffering disgrace for the Name.” This can encourage us, as a nation which has declared itself Christian, not to take the social and economic crisis in which we find ourselves, as a sign that God has abandoned us. God counted us worthy of suffering. We can still continue to thank God in all things. Even if we are badly hurt by the disrespect, poverty, a weak kwacha, load shedding and general distress in our midst, even if we hope and pray that this Day of Repentance, Fasting, and Prayer will be part of a turnaround, of God lifting us up again, even then, we still can and should thank God, since our whole life should be a life of thanksgiving. It is very commendable that the Zambian government now wants to take even the social and economic crisis in which they find themselves, to God, by encouraging the nation to this Day of Repentance, Fasting, and Prayer. But what are we repenting for? In the famous play Waiting for Godot by Samuel Beckett two tramps, Vladimir and Estragon, try to pass the time while they are waiting for this mysterious figure Godot. At one stage we hear the following dialogue: Vladimir: Suppose we repented. Estragon: Repented what? Vladimir: Oh… (He reflects) We wouldn’t have to go into details. But I am afraid that that is exactly what we have to do: to go into details. Without such details ‘repentance’ becomes an empty term, it does not mean anything anymore. If you remove the details, nothing is left of this so-called repentance. That is in fact the joke that Beckett is making here. Repentance should be for something specific, otherwise it loses its meaning. Both the surroundings, such as described above as our whole lives as lives of thanksgiving, and the specifics of what we repent about are crucial for the day of repentance to be meaningful. We do have to go into details, not just about the occasion for a day of repentance, such as the social and economic crisis, but as well and especially about what it is that we are repenting for. Our details include repentance against corruption, tribalism and nepotism. This will also mean identifying those who have stolen and deprived the poor of their basic sustenance, that they restore what they took. In Luke 19 we see that Zacchaeus when confronted with his own sin he asked for forgiveness and paid back all that he had overcharged people. 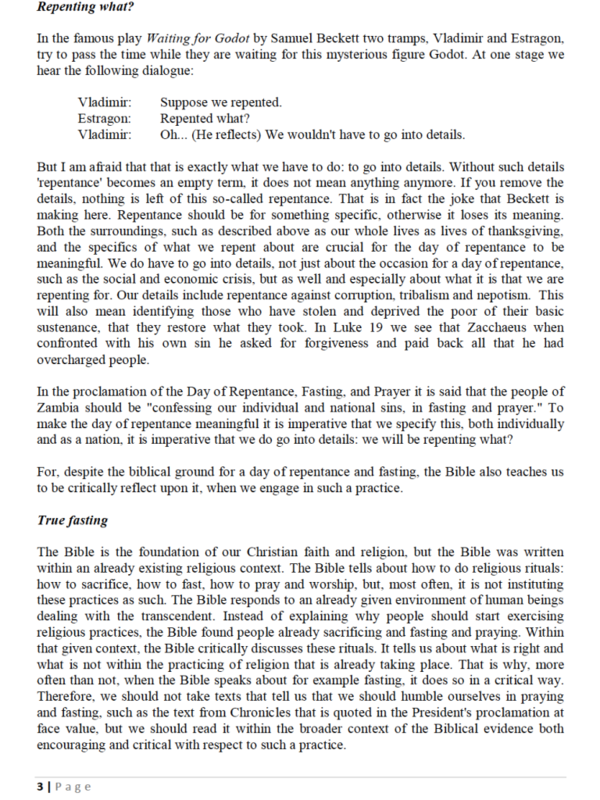 In the proclamation of the Day of Repentance, Fasting, and Prayer it is said that the people of Zambia should be “confessing our individual and national sins, in fasting and prayer.” To make the day of repentance meaningful it is imperative that we specify this, both individually and as a nation, it is imperative that we do go into details: we will be repenting what? For, despite the biblical ground for a day of repentance and fasting, the Bible also teaches us to be critically reflect upon it, when we engage in such a practice. The Bible is the foundation of our Christian faith and religion, but the Bible was written within an already existing religious context. The Bible tells about how to do religious rituals: how to sacrifice, how to fast, how to pray and worship, but, most often, it is not instituting these practices as such. The Bible responds to an already given environment of human beings dealing with the transcendent. Instead of explaining why people should start exercising religious practices, the Bible found people already sacrificing and fasting and praying. Within that given context, the Bible critically discusses these rituals. It tells us about what is right and what is not within the practicing of religion that is already taking place. That is why, more often than not, when the Bible speaks about for example fasting, it does so in a critical way. 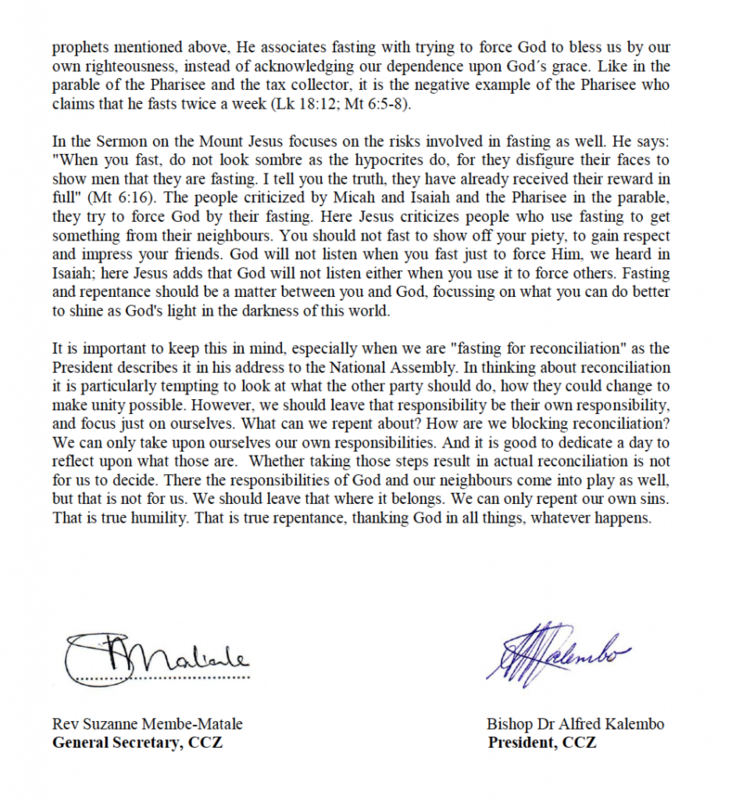 Therefore, we should not take texts that tell us that we should humble ourselves in praying and fasting, such as the text from Chronicles that is quoted in the President’s proclamation at face value, but we should read it within the broader context of the Biblical evidence both encouraging and critical with respect to such a practice. We should follow the Bible in taking this critical and nuanced stance by reading a text like that from Chronicles side by side with for example the witness of the prophet Micah about sacrifice and of the prophet Isaiah about true fasting. Micah criticizes the excessive offerings that are taking place as if that is all that God wants from us. He asks: “Will the Lord be pleased with thousands of rams, with ten thousands of oil?” (Mic 6:7). Of course, that is not what God is primarily focused on, Micah concludes, saying that God “has showed you, O man, what is good. And what does the Lord require of you? To act justly and to love mercy and to walk humbly with your God” (Mic 6:8). All those rituals, all those ways of appeasing the spiritual world that humans were already engaged in, the Bible here by the mouth of Micah is critical of that. 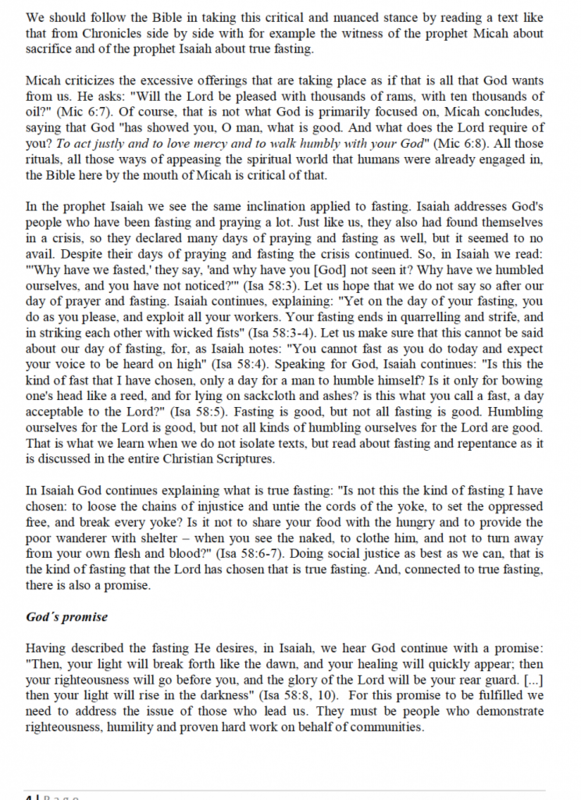 In the prophet Isaiah we see the same inclination applied to fasting. Isaiah addresses God’s people who have been fasting and praying a lot. Just like us, they also had found themselves in a crisis, so they declared many days of praying and fasting as well, but it seemed to no avail. Despite their days of praying and fasting the crisis continued. So, in Isaiah we read: “‘Why have we fasted,’ they say, ‘and why have you [God] not seen it? Why have we humbled ourselves, and you have not noticed? '” (Isa 58:3). Let us hope that we do not say so after our day of prayer and fasting. Isaiah continues, explaining: “Yet on the day of your fasting, you do as you please, and exploit all your workers. Your fasting ends in quarrelling and strife, and in striking each other with wicked fists” (Isa 58:3-4). Let us make sure that this cannot be said about our day of fasting, for, as Isaiah notes: “You cannot fast as you do today and expect your voice to be heard on high” (Isa 58:4). Speaking for God, Isaiah continues: “Is this the kind of fast that I have chosen, only a day for a man to humble himself? Is it only for bowing one’s head like a reed, and for lying on sackcloth and ashes? is this what you call a fast, a day acceptable to the Lord?” (Isa 58:5). Fasting is good, but not all fasting is good. Humbling ourselves for the Lord is good, but not all kinds of humbling ourselves for the Lord are good. That is what we learn when we do not isolate texts, but read about fasting and repentance as it is discussed in the entire Christian Scriptures. In Isaiah God continues explaining what is true fasting: “Is not this the kind of fasting I have chosen: to loose the chains of injustice and untie the cords of the yoke, to set the oppressed free, and break every yoke? Is it not to share your food with the hungry and to provide the poor wanderer with shelter – when you see the naked, to clothe him, and not to turn away from your own flesh and blood?” (Isa 58:6-7). Doing social justice as best as we can, that is the kind of fasting that the Lord has chosen that is true fasting. And, connected to true fasting, there is also a promise. God´s promise Having described the fasting He desires, in Isaiah, we hear God continue with a promise: “Then, your light will break forth like the dawn, and your healing will quickly appear; then your righteousness will go before you, and the glory of the Lord will be your rear guard. […] then your light will rise in the darkness” (Isa 58:8, 10). For this promise to be fulfilled we need to address the issue of those who lead us. They must be people who demonstrate righteousness, humility and proven hard work on behalf of communities. Of course, this is what we want. This is what gives us reason in the darkness of our social and economic crisis to call upon the Lord, that we humble ourselves, hoping God will forgive our sins and heal our land. But note, that God does not promise that the darkness will go away, not yet, no, our light will rise in the darkness. The darkness may remain, but our righteousness will go before us, that will be our light, whether God will lift us from our dire circumstances as well, is not up to us that is up to God and we should leave that to God. But what God promises us if we engage in this true kind of fasting, the fasting which involves sharing our food with the hungry, providing the poor wanderer with shelter, and clothing the naked, then our light will shine within whatever darkness we may find ourselves in. Just like Peter and the other disciples shone their light even while they were in prison, rejoicing and thanking God, even while they were flogged and treated disgracefully. That is the promise we can build upon. 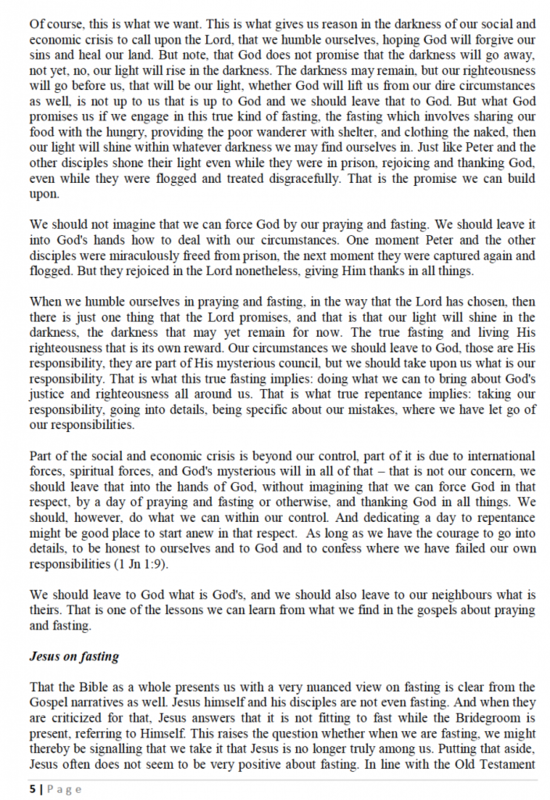 We should not imagine that we can force God by our praying and fasting. We should leave it into God’s hands how to deal with our circumstances. One moment Peter and the other disciples were miraculously freed from prison, the next moment they were captured again and flogged. But they rejoiced in the Lord nonetheless, giving Him thanks in all things. When we humble ourselves in praying and fasting, in the way that the Lord has chosen, then there is just one thing that the Lord promises, and that is that our light will shine in the darkness, the darkness that may yet remain for now. The true fasting and living His righteousness that is its own reward. Our circumstances we should leave to God, those are His responsibility, they are part of His mysterious council, but we should take upon us what is our responsibility. That is what this true fasting implies: doing what we can to bring about God’s justice and righteousness all around us. That is what true repentance implies: taking our responsibility, going into details, being specific about our mistakes, where we have let go of our responsibilities. Part of the social and economic crisis is beyond our control, part of it is due to international forces, spiritual forces, and God’s mysterious will in all of that – that is not our concern, we should leave that into the hands of God, without imagining that we can force God in that respect, by a day of praying and fasting or otherwise, and thanking God in all things. We should, however, do what we can within our control. And dedicating a day to repentance might be good place to start anew in that respect. As long as we have the courage to go into details, to be honest to ourselves and to God and to confess where we have failed our own responsibilities (1 Jn 1:9). We should leave to God what is God’s, and we should also leave to our neighbours what is theirs. That is one of the lessons we can learn from what we find in the gospels about praying and fasting. That the Bible as a whole presents us with a very nuanced view on fasting is clear from the Gospel narratives as well. Jesus himself and his disciples are not even fasting. And when they are criticized for that, Jesus answers that it is not fitting to fast while the Bridegroom is present, referring to Himself. This raises the question whether when we are fasting, we might thereby be signalling that we take it that Jesus is no longer truly among us. Putting that aside, Jesus often does not seem to be very positive about fasting. In line with the Old Testament. prophets mentioned above, He associates fasting with trying to force God to bless us by our own righteousness, instead of acknowledging our dependence upon God´s grace. Like in the parable of the Pharisee and the tax collector, it is the negative example of the Pharisee who claims that he fasts twice a week (Lk 18:12; Mt 6:5-8). In the Sermon on the Mount Jesus focuses on the risks involved in fasting as well. He says: “When you fast, do not look sombre as the hypocrites do, for they disfigure their faces to show men that they are fasting. I tell you the truth, they have already received their reward in full” (Mt 6:16). The people criticized by Micah and Isaiah and the Pharisee in the parable, they try to force God by their fasting. Here Jesus criticizes people who use fasting to get something from their neighbours. You should not fast to show off your piety, to gain respect and impress your friends. God will not listen when you fast just to force Him, we heard in Isaiah; here Jesus adds that God will not listen either when you use it to force others. Fasting and repentance should be a matter between you and God, focussing on what you can do better to shine as God’s light in the darkness of this world. It is important to keep this in mind, especially when we are “fasting for reconciliation” as the President describes it in his address to the National Assembly. In thinking about reconciliation it is particularly tempting to look at what the other party should do, how they could change to make unity possible. However, we should leave that responsibility be their own responsibility, and focus just on ourselves. What can we repent about? How are we blocking reconciliation? We can only take upon ourselves our own responsibilities. And it is good to dedicate a day to reflect upon what those are. Whether taking those steps result in actual reconciliation is not for us to decide. There the responsibilities of God and our neighbours come into play as well, but that is not for us. We should leave that where it belongs. We can only repent our own sins. That is true humility. That is true repentance, thanking God in all things, whatever happens.